My home rose garden. Chemical free for over a decade. My Journey to All Natural Rose Gardening. I suppose my journey to an “All-Green” Rose Garden truly began when I was a boy and stems from what didn’t happen at our home in the Miami, Florida suburb I grew up in. What didn’t happen is mostly due to my ancestry of being a first-generation American. My family hails from The Netherlands — a tiny little country on the North Sea where land is so precious you do not mistreat it. When preparing a new field for your crop first involves draining the ocean, you work hard to be a good steward of the land. This was passed to my parents who then passed it on to me. What didn’t happen in that suburban lawn in South Miami in the 1960’s was chemicals. Our lawn was a cheerful mish-mash of St. Augustine and bermuda grass, plus whatever weeds grew in-between. If it was “green and we could mow it” it was lawn. Shrubs grew happily without extra care and watering was rarely done, if only because the hoses that needed to be dragged around weighed a ton. Fruit trees from avocado to mango to key lime to grapefruit grew, bore fruit and were never treated with anything. Occasionally the lawn got a fresh load of top soil scattered across it but that was about it. While others were living on perfect lawns laced with chemicals, we never bothered and let nature run its course. Returning to The Netherlands for visits I would see all my relatives treating their land the same way and thought nothing of it. In 1988 Queen Beatrix in her annual Christmas Speech challenged the tiny little country to go greener than it already was, and as a result the Dutch are among the world’s leaders in that field and have been for the last twenty-five years. With this mindset I once again began gardening again in the early 1990s. I was living in Los Angeles, California looking for a new direction in my life and came upon roses as a recreational hobby. That I was hooked is evidenced in what I do for a living today so there is no need to elaborate on that. Keep in mind Southern California during that time was a hotbed of Hybrid Teas, rose exhibiting and gardens grown artificially out of the desert. Like one giant movie set those gardens had to be perfect without a grass blade out place, a weed nowhere to be found and roses that looked like they were made of silk. All of this took massive amounts of chemicals – most of them dangerous. As with most things in life, my foray into the professional world of roses was an accident. A member of our rose society asked me to help prune their roses then a neighbor asked me what I charged, and in 1992 a rose care company was born. Having just started into roses and knowing little about them, I simply followed the prevalent thought of the time as to what roses needed. Products like Orthene, Funginex, Avid, Peters 20-20-20 and various other chemicals were applied to my customer’s roses like clockwork. Even then it made me uncomfortable and I began to look for another way. One of the products we did apply was fish emulsion. While smelly, it was incredibly effective and the greening of the foliage and health of the plants was instantly apparent. This was as close to a natural product as we used in our rose care program and it seemed to outshine the others in terms of long term effect. My rose mentor was Dr. Thomas Cairns – one of the best minds I know in regards to what roses need nutritionally. Tommy knew I preferred more natural methods and his advice in helping me formulate my early natural rose care programs was invaluable and a credit to his broader view of the rose world. The first natural treatment we did was for powdery mildew. Simply put, Tommy put together the following, 1 tbs each of baking soda, insecticidal soap, canola oil and white vinegar. The baking soda would penetrate the membrane of the mildew spore and dehydrate it, thus killing it. The soap would help with aphids and the canola oil worked as a spreader sticker. The white vinegar emulsified it all. It worked very well and although not as quickly as chemicals, I was beginning to get customers who were willing to live with roses that did not look like they came off a MGM back lot. I also began to get heavily into Antique Roses. The varieties available were those that had stood the test of time so the group as a whole was more disease resistant than many modern roses, which grew up dependant on chemicals. Perhaps the problem was not that roses were chemically dependent, but that we were growing the wrong kinds of roses – and when we did grow disease resistant Garden Rose varieties, we cared for them with the wrong philosophy. To find a way to apply my thoughts, I began from the bottom up and that meant the soil. The soils I came upon in my client’s rose gardens were constantly blown clean of all leaves and debris leaving a very sterile environment. Already knowing a forest floor where leaves and everything else is allowed to naturally decompose is one of the richest soils in the world, it made sense to jump start these gardens with some form of non-sterile compost containing living microbes. Everything sold in stores at the time was “sterilized”, which defeated the purpose. Instead we made trips to the Los Angeles Equestrian Center where out back was a mountain of shredded, composted horse manure and shavings. Hauling it to our client’s gardens in pickup trucks, we spread it three to four inches thick. The result was simply astonishing. Roses that had done just okay even with fertilizers suddenly took off and bloomed beautifully. They began to get less disease and even better I was able to cut back on the watering. We were on our way. My research took me into the world of mycrorizzan and their impact on plant life. Mycrorizzan attach themselves to the plant’s roots, put out long tendrils then draw nutrients and water toward the plant from a distance beyond the reach of its roots. In exchange they receive sugars from the plants as food. Constantly cleaning out our gardens of composted plant life and pouring systemic “All-in-One” chemicals into the ground sterilizes our soil, making our roses more and more chemically dependent. Instead of raising roses we were raising junkies. In the mid 1990s downy mildew began to rear its ugly head in Southern California. This disease can take down a rose in three days or less and the only “cure” at the time was to cut back the roses, spray them with sulfur and hope for the best. Remarkably of the some sixty plus rose gardens we took care of downy mildew hit the chemically dependent roses hardest. My roses at home that were raised naturally ala my “Dutch” methods were never hit and the clients converting to our natural program lost few if any roses. Perhaps roses kept healthy through a well-balanced natural diet, gently exposed to local strains of pathogens would slowly build their own immunity? In another twist of fate, my wife’s brother came down with stage four melanoma cancer. This is a “write your will” stage of this particular cancer. Forgoing chemo and radiation he chose the Gerson Diet. This treatment is built on the philosophy that the human body already has within it the ability to fight any disease if you just remove the chemicals (in the form of preservatives, growth hormones found in meat etc) that distract it from focusing on the disease – in this case cancer. Call it the Slow Food Movement Health Care Plan. Happily fourteen years later he is completely cancer free as a result. Would the same apply to plants? The last part of this journey before I made the transition from thought to action came about on our farm in South Carolina. Before we moved here full time I planted some sixty roses on the property. I amended the soil well with horse manure, planted them and for five years they were never sprayed, fertilized or irrigated. Every year I went back in spring to find them a little healthier and less disease present than the previous year. Roses like Yolande d’Argon, Alchymist and others, slowly stopped getting blackspot even though it had run rampant in their adolescence. I discussed this observation with many rosarians and few if any disagreed, plus noticed the same thing when they stopped spraying. What I took away from this period is that the right rose, grown in good healthy soil, on a synthetic-chemical free program designed to build the soil and plant’s long term health in tandem, is in the long run able to ward off diseases and be a better plant. This thought was temporarily shelved when I started Ashdown Roses. As with any new business it took all my time and more. At Ashdown initially we used chemicals because as a commercial nursery we were regularly inspected by the USDA regarding our shipping license, but we still followed the practice of amending the soil every year with composted horse manure. My home rose garden continued on without any treatments and I added rose after rose, including many considered disease prone to continue to test my theories. Happily, even the disease prone ones soon became healthy plants after a period of adjustment. Soon we began planting the Ashdown Rosarium. This is a rose garden open to the public, based on the design of the Fineschi Garden in Italy. The Modern roses are arranged in beds by hybridizer and the Antique roses by class. Currently holding close to 2000 roses, it covers 3 acres and will eventually hold 6000-7000 varieties of roses of all kinds. Its goals are preservation, presentation and education of our national flower, the rose. 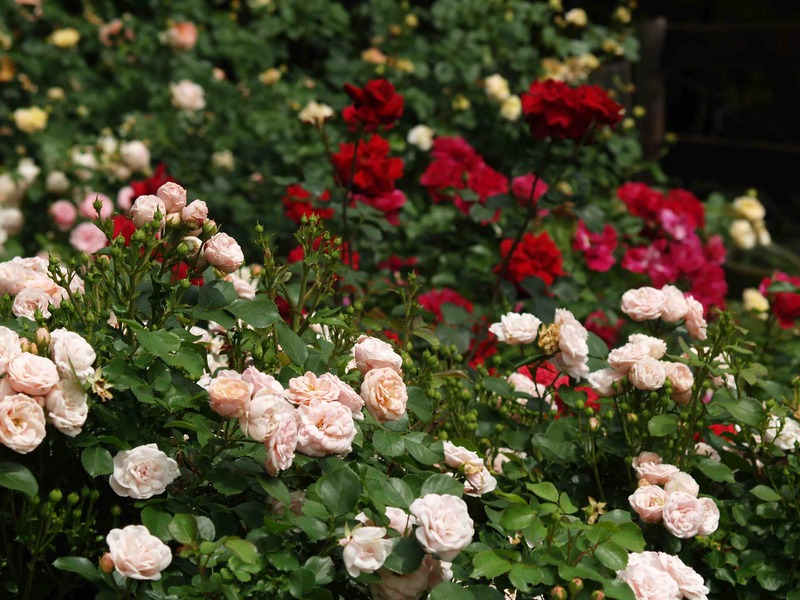 All the roses grown in the Rosarium are now grown without synthetic chemicals. With the nursery settling in and the start of the Rosarium, I was now able to slowly work in other natural treatments, and the process of weaning our roses off chemicals began. I began contacting every “organic” fertilizer company I could find, explained to them what I was doing, and my eventual goal of putting together a complete natural rose care program that began with the soil. Product after product arrived, I would section off a few roses and test it, or take it home and test it there. While many worked, I felt it was still too scattered in its approach. The second part of my goal was to create a rose care program that was easy to use. I wanted to do away with the guesswork of having to figure out which products went with which. I approached several companies and few “got” the complete approach I was after. The nursery by this time was getting off chemicals by using practices I had developed back in Los Angeles. Unfortunately they were not practical for the home gardener. While at a Home and Garden Show in Charlotte, NC I met Billy Styles owner of Organic Plant HealthCare. I’d been impressed by their booth and the professional appearance of their products. I left my card, asking for Billy to stop by my booth at some point. When he did he began quizzing me about what I did for my roses. One of his first questions was how did I put my roses to bed? This stopped me cold, but when he explained the importance of not only shutting down the plant but also of keeping the soil alive during the winter, I thought perhaps I had found the partner I was looking for. Explaining my thoughts for a Complete Natural Rose Program, Billy in five minutes not only understood it but I suspect figured out how to bring it about. I then took the idea to Peter and Richard Beales and they agreed to become involved. Billy and I tested product after product at Ashdown Roses and my home. The Beales Family did the same. Richard Beales and I made notes on what we wanted from our roses at certain times of the season and Billy formulated products based on those plus his knowledge of soil construction and plant life. After a season’s worth of testing we had a program in place, and by then Ashdown and the Rosarium were completely synthetic chemical free thanks to Billy’s guidance. If I am going to tell people to use this program, I need to use it myself and that includes the commercial and Rosarium end of what we do. The result is the Peter Beales Complete Natural Rose Care product line. In essence it is perhaps the only complete natural rose care line that works on the premise of healthy soil = healthy roses = less disease and stress. Each product was custom formulated by Billy to do certain things at certain times during the season. It is not a cookie cutter product whereby you simply apply the same formula in the coolness of spring as you do in the heat of summer as you do in the waning days of fall. We also made it easy. As the products are mixed fresh, they are mailed to your door when it is time to use them. You know its time to feed your roses when the product shows up in your mailbox. The country of my ancestors has been green for decades. This journey has simply been one back to my past – to not doing now what we did not do then in our suburban Miami garden. Rose growing should be easy, fun and clean and it’s important we continue down this sustainable path.